During the TargetAMD gene therapeutic approach, the human PEDF (Pigment Epithelium Derived Factor) gene sequence will be delivered to patients’ isolated autologous pigment epithelium cells by utilising the Sleeping Beauty (SB100X) technology. The SB gene delivery system has been developed as a vertebrate non-viral gene therapy approach realised by partner MDC, in cooperation with partner PEI, within an EU funded project (INTHER – FP6). The first clinical trial using the SB gene delivery system has been approved by the FDA (Federal Drug Administration) in the USA, and was initiated in 2011 by genetically modifying human autologous immune cells. To transfer the SB based technology to the first clinical trial phase Ib / IIa in Europe, the effort of the pre-clinical investigations is to verify the stability of the therapeutic gene expression in vitro as well as in vivo. Hereby the gene delivery modality, the prospective approved Gene Therapy Medicinal Product (GTMP), and their well-defined and established protocols have been optimised in work package 2 to ensure quality and safety of the prospective gene transfer. 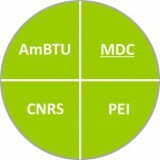 The closely collaborating partners MDC, PEI and CNRS (Fig. 1) evaluated optimisation steps of the final vector system. For instance, partner CNRS eliminated the antibiotic resistance backbone (pFAR4 plasmid) of the plasmids in order to enhance safety (Fig. 2). 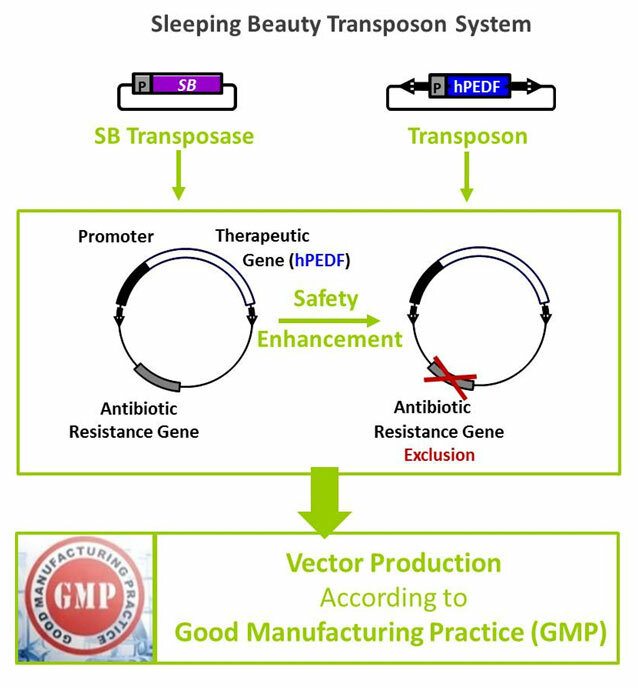 At last, the optimised vectors, the transposon with the PEDF gene, as well as the transposase, leads to the production of plasmid clinical lots on the basis of Good Manufacturing Practice (GMP) guidelines. GMP-grade plasmid production is realised by experienced partner AmBTU, who holds a GMP manufacturing license for biopharmaceuticals. Plasmid clinical lots are used in pre-clinical animal models but also in the clinical trial approved by the regulatory authorities in Switzerland. The first milestone of the project is represented by the plasmid production according the GMP guidelines.